So Mr. Bauer here thinks that his Firefox add-in blog editor is so great. Well riddle me this El Di Pablo, is your Scribefire extra bloated and can come bundled with a bunch of extra useless Microsoft products? No it can't! Even with it's faults I still love the MS Live Writer. It's extremely basic to use but has the power to become much more powerful by installing add-ins for it. It also functions a lot like MS Word. Which most everyone knows how to use and can support publishing to multiple preset and even custom blogs. So if you have your own blog format or even just a blog or news section on your site such as with the Umbraco ASP.Net CMS application you can easily set it up to have MS Live Writer connect and publish content to it. Now I know some of you out there are saying, "Hey, this is just another dumb useless MS App." well you're wrong. The Live Writer is probably one of the only good things about the new MS Live software. I mean seriously, who wants to change any set of numbers on a web page that could look like a phone number all of a sudden become links to make a phone call from. Yeah, that's part of some crappy phone call live add on crap that will come installed if you don't deselect it from the install. Even though the install (like a lot of installs out there) you have to be careful about what you're selecting to install or you'll get a bunch of crap, but the Live Writer is very well worth it. One of the best features about it now is that at least with blogger you can schedule your post. All the date/time stuff is located down in the bottom right of your window. Oh and did I mention that it comes with spell check? Yeah, that's right you Wizards out there watch out. Anyway, well it does that coupled with add-ins to accomplish just about anything else you need. It's really a lot better than Scribefire. 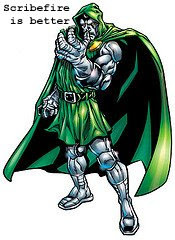 Even if Dr. Doom says Scribefire is better, and guess what I used to write this post?